Spring migration is underway! It’s time to prepare your backyard to welcome the spring migrants. Bird seed is great for winter birds, and many migrating birds will appreciate it, but there are other things you can do in your backyard to welcome the new birds. A beautiful bird you will find nesting this month, the Baltimore Oriole, isn’t a big fan of seeds — they have an appetite for something sweeter. During migration Baltimore Orioles love to drink nectar and eat sugary fruits. Sugars in these foods are quickly converted to fats, which fuels their migration. 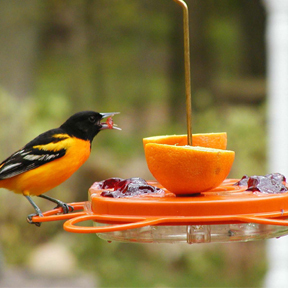 You can purchase a specialized oriole feeder, which usually comes with spikes for you to secure fresh apple or orange halves. Orioles will land on the sturdy perches of these feeders and stab holes in the fruit, from which they will lap up the sweet fruit juices. If you’re on a budget, just put out a couple of boards with nails through them, then stab the fruit halves onto the exposed nails. Baltimore Orioles also love jam and jelly. Put a small dish with jam or jelly in it on a tall platform and watch these colorful birds come in to lap up the sweet food. Hummingbirds and orioles both like to drink sugar water. If your aim is to feed orioles rather than hummingbirds, you should dilute the sugar water more (6 parts water to one part sugar for orioles, 4:1 for hummingbirds). Specialized oriole nectar feeders have sturdier perches, since orioles are larger than hummingbirds. Remember to change the water frequently, at least once every three days depending on the weather. Sugar water will ferment over time, especially in warm temperatures, and this can be deadly for nectar feeding birds. Birdscape your yard by providing migrants with berries to eat. Holly bushes provide berries from late winter into spring, and blackberries will provide berries for late migrants. These shrubs also provide good perches for migrants to rest until they resume migration. Insects provide an excellent source of protein. Mealworms, both fresh and dried, will attract many different birds to your backyard. Just a word of caution on mealworms….they are addictive, so make them a treat only. Bluebirds love mealworms, but so do many resident bird species, such as chickadees and nuthatches. If you don’t want to purchase a mealworm feeder, just make sure the mealworms are visible. Put them up on a platform on a small plate, and watch the birds come in!